If you’re booking a rafting trip this July, you may be weighing all your options for when to go, where to go, what to pair your adventure with, etc. 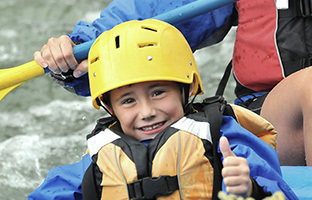 Many choose afternoon excursions on the river and overlook morning whitewater outings. However, morning trips are the best time to get out on the water, especially during the month of July. To help you decide what time of day you want to go rafting, here are four reasons why you should choose a morning excursion. Many veer towards afternoon trips during the summer for a variety of reasons and those are probably the ones who aren’t reading this post. Afternoons on the river get crowded. Between the many other rafting outfitters and AVA Rafting & Zipline, you’ll see lots of rafts and lots of people throughout the afternoon on the river. Choose a quieter and more personal experience by taking on the river before everyone else gets their day going. Every now and then the Colorado Rockies experience rain throughout the day, but a large amount of summer mornings are clear blue skies before the afternoon rain showers in July roll in. If you wait it out and don’t hop on a raft until 1:00 PM, it’s likely it’ll cloud up. Believe us or not, it gets pretty warm in the afternoon in Colorado. One may think “then why wouldn’t we just go in the afternoon, since the water will feel better?”. Sure, it always feels good to take a swim during a hot afternoon, but you can’t forget the fact that Colorados rivers are snow melt so the water will not be warm. Ever. Enjoy a mild-weathered morning on the river. If you have an afternoon trip planned, it’s possible you’ll catch yourself sleeping in and having a easy and slow-going morning. Don’t waste any time during your time in Colorado! If you spend your morning on the river, you’ll have all afternoon to venture around whichever outpost you chose to go to and Colorado is full of plenty to see. Whether you’re looking for a post-rafting craft beer in Idaho Springs or want to explore Main Street in Buena Vista, you’ll start your day with adventure and get to enjoy the rest of your day in the breathtaking Rocky Mountains. There it is! If you’re heading to Buena Vista and you don’t want to make your drive super early, we’ve got you covered. Book one of our cabins or campsites located at AVA’s Buena Vista outpost and spend a few days in the beautiful Arkansas River Valley. Call AVA today to line up your morning rafting adventure today, or book online and save 10% with promo code ONLINE10.